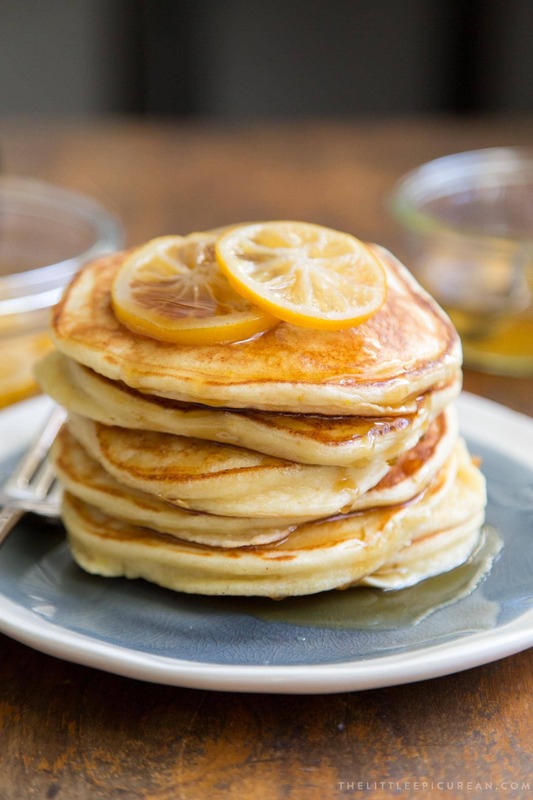 These Meyer Lemon Ricotta Pancakes are fluffy, flavorful, and such a treat in the morning. 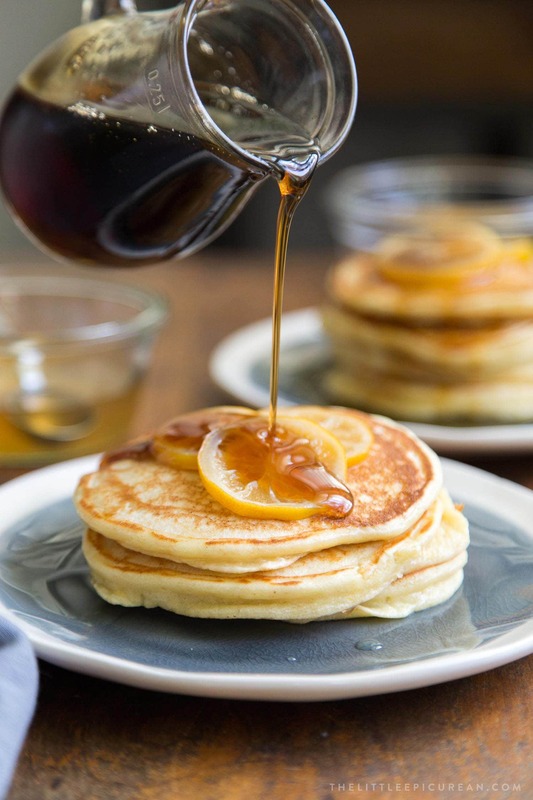 The stack of pancakes are garnished with homemade candied Meyer lemons and topped with maple syrup. While ricotta is most popular for use in lasagnas and other savory dishes, ricotta is a wonderful addition to sweets as well. It is commonly used to fill cannoli, mixed into cheesecakes, and folded into ice cream. Adding ricotta to pancakes adds a unique rich creaminess that keeps you returning bite after bite. 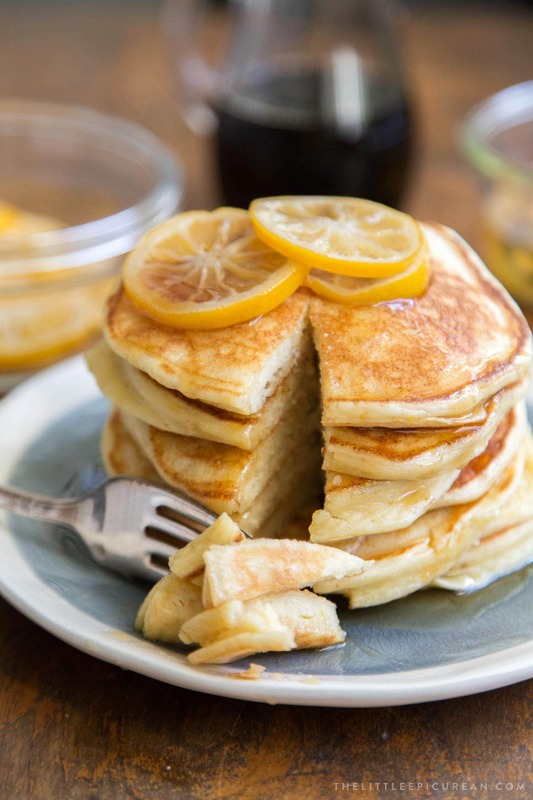 The use of Meyer lemons makes these pancakes different. While it smells like a regular lemon pancake, it’s not very tart. The “lemon” flavor of these pancakes are very mild and quite floral. They’re not at all sour. If you are interested in a more intense “lemon” flavor, I recommend you check out these lemon pancakes. Meyer lemons are native to China. They are said to be a hybrid of lemon and mandarin oranges. The name “Meyer” refers to the US Department of Agriculture employee who introduced the citrus to the United States in 1908. Meyer lemons are available from late October until mid April. Unfortunately, they are difficult to find outside of their season. Luckily, Meyer lemons grow well in Southern California (as well as Florida and Texas). During the winter months, you can easily find Meyer lemons at local SoCal farmers’ markets. How are Meyer lemons different from standard lemons? Standard lemons are sour. While lemon juice is lip puckering sour, lemons provide the perfect addition of acid and balance to a variety of sweet and savory dishes. On the other hand, Meyer lemons are much sweeter than the standard lemon. While still tart, Meyer lemons are far more floral and delicate in the flavor. Due to it’s connection with Mandarin oranges, Meyer lemons have very thin, smooth skin. They’re also much smaller than the standard lemon. 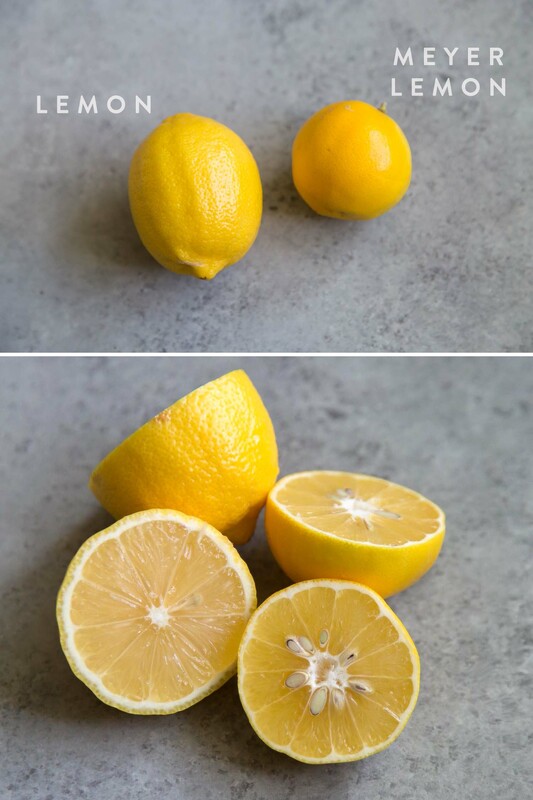 Instead of the common lemon’s bright yellow skin, Meyer lemons have a deeper yellow hue, almost faint orange in color. Candied citrus requires a bit of patience, but it is easy to make. They can be eaten on their own as a snack or used to garnish a variety of dishes. Once cooked, the citrus can also be tossed in granulated sugar. 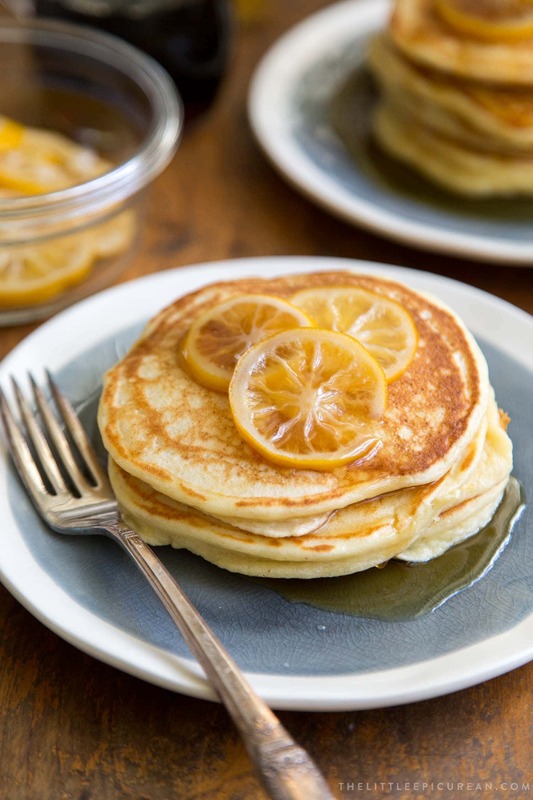 The candied lemons add a fresh sweetness to these Meyer lemon ricotta pancakes. For more candied citrus recipes have a look at these candied blood oranges used to garnish these baked blood orange donuts as well as this blood orange olive oil cake. This lemon meringue cake is topped with candied lemon slices. Combine water, sugar, and honey in a heavy bottomed sauce pot. Bring to a boil until sugar has dissolved. Add Meyer lemon slices. Reduce heat to low and let simmer for 30-40 minutes, flipping lemon slices every 10-15 minutes. Cook until lemon slices are tender. Gently remove lemon slices from syrup. Transfer to a parchment lined sheet tray. Arrange slices in a single layer and allow to cool. Strain syrup and let cool. Store syrup in the fridge for later use. Once lemon slices have cooled, transfer to airtight container and keep stored in the fridge until ready to use. In a large bowl, whisk together flour, oat flour, baking powder, and salt. In another bowl, beat together egg yolks, Meyer lemon zest, and sugar until smooth. Add Meyer lemon juice and milk. Mix until well combined. Add wet ingredients to large bowl with dry ingredients. Stir until just combined. The batter will be lumpy. In another bowl, beat egg whites to stiff peaks. Add egg whites to batter in three additions, gently folding egg whites to distribute. The batter will loosen and smooth out as egg whites are added. Lightly grease griddle or large skillet with butter or ghee. Set over medium heat. Once griddle is hot, pour in 1/3 cup portions of batter. Cook until bubbles begin to form on surface, about 2 minutes. Flip pancake over with spatula and cook other side until lightly browned. Repeat with remaining batter. Adjust heat accordingly if pancakes are browning too fast. 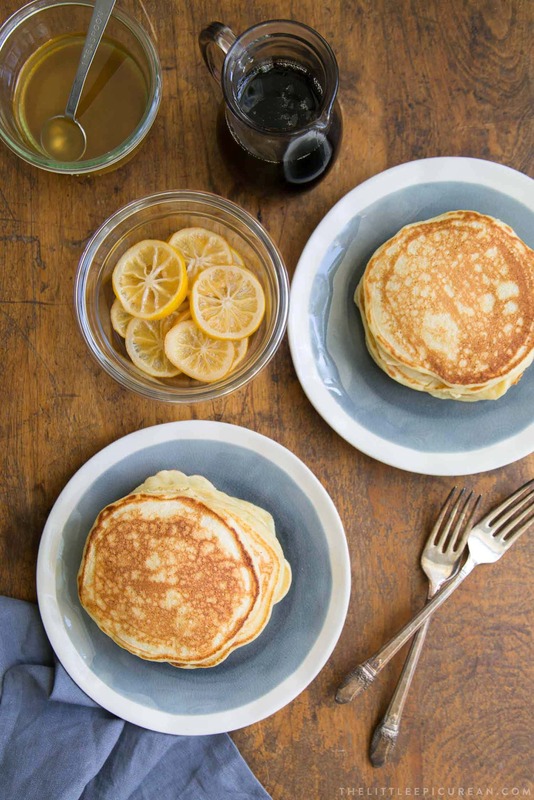 Serve pancakes warm with chilled candied lemon slices and maple syrup. If desired, drizzle served candied syrup over pancakes for additional sweetness. All-purpose flour can be used in place of oat flour. I used this brand of oat flour. However, you can also make your own oat flour by processing old-fashioned oats (also known as rolled oats) to a find powder. Sift to remove any large particles. Regular lemons can be used in place of Meyer lemons. Regular lemons will be a bit more tart. Reduced-fat milk, low-fat milk, or non-dairy milk alternative can also be used.